Bell Pepper or Capsicum has a very unique flavor and renders a beautiful and distinct flavor to any dish it is used in. I use it alot in my kitchen. 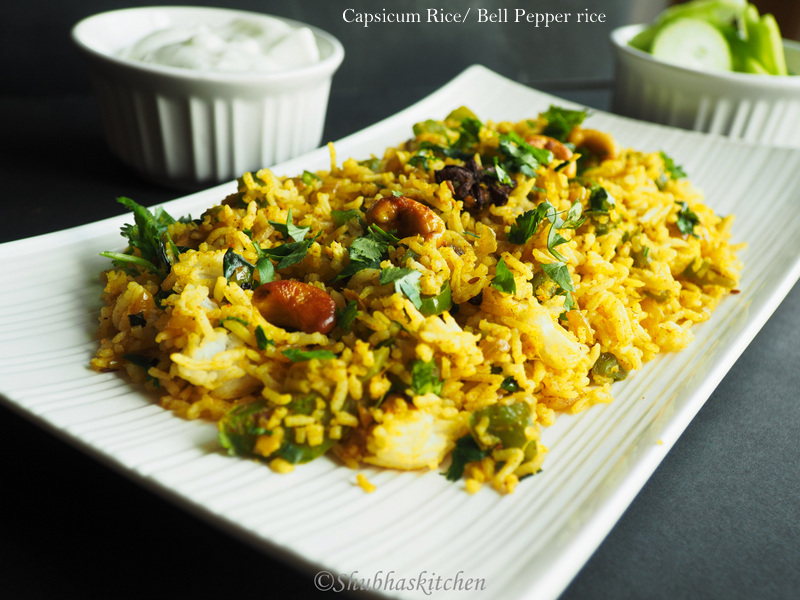 Today, I bring to you a delicious rice preparation using Bell Peppers. 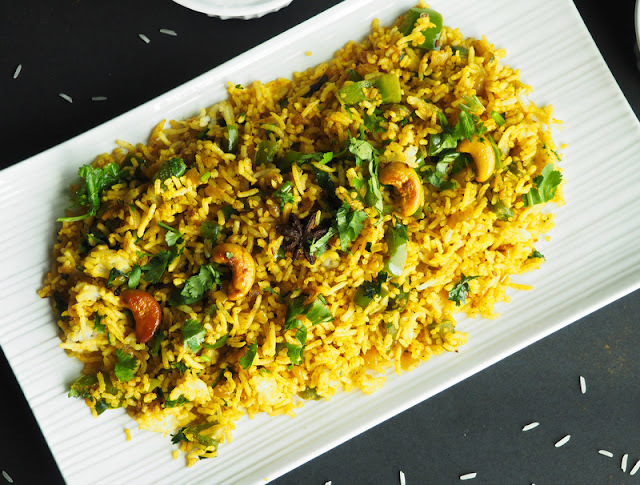 It can be prepared with left over rice (although I often cook rice just to make this rice dish) and makes a great lunch box option. Heat oil in a deep bottomed pan. When hot, add the cashews, Cinnamon, cardamom, blackpepper, cloves , star anise and bay leaf. When the cashews have slightly changed color, add the cumin seeds. When the cumin seeds start to splutter, add the onion, ginger and farlic. Mix well. When the onion turns translucent, add the capsicum / bell pepper. Sprinkle some salt. Also add the dry masalas : Turmeric powder, red chilli powder, Coriander powder and garam masala. Mix well. Cover and cook on low heat until the bell pepper has cooked. Add the rice. Adjust the salt (Remember , we added some salt in the beginning). Mix gently. Add the chopped coriander leaves / cilantro. Mix well and serve hot with raita or yogurt of your choice. You can use left over rice for this dish. If cooking rice freshly for this dish then cook and spread it in a large plate. Cool completely and then use it in the recipe. 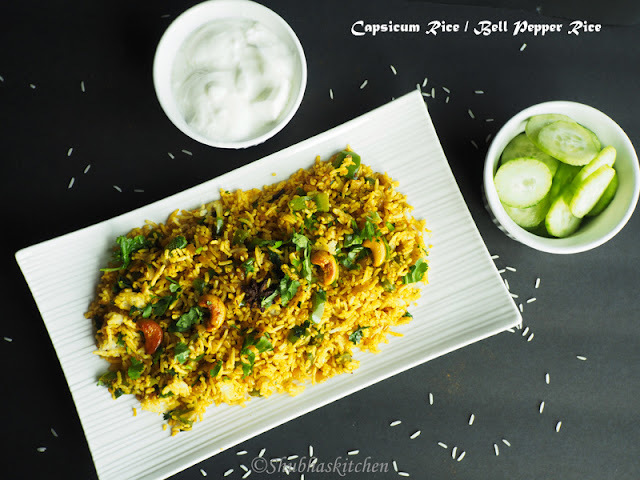 i like the flavor of capsicum in my rice dishes.. This is another favourite and quick dish I make especially with leftover rice....lovely share!! You showed a rice dish, I love you Subha. 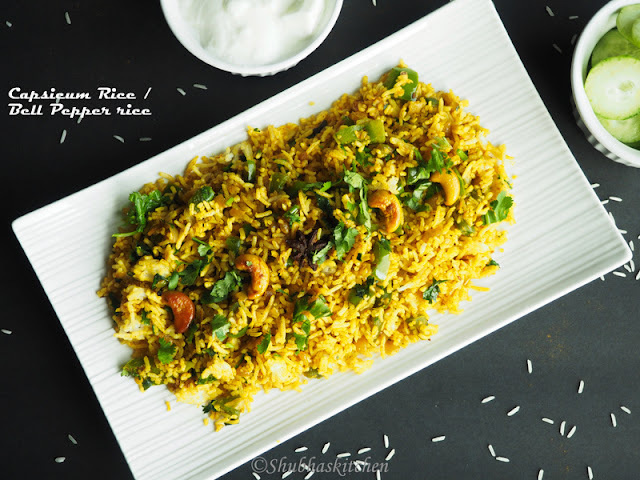 I love this rice dish superbly.